Patients suffering from Fibromyalgia experience symptoms such as chronic widespread muscle pain, tenderness, fatigue, muscle spasms, anxiety, sleep disturbances, brain fog and more. Fibromyalgia is the medical term used for patients who suffer with total body pain. Fibromyalgia patients not only suffer with tremendous body pain, severe muscle spasms and “trigger points” they also suffer with anxiety issues because the excessive electrical current running throughout every nerve in their body also pulses throughout their brain! Fibromyalgia patients suffer from undiagnosed deficiencies of calming neurotransmitters and excessive activity of excitatory or electrifying neurotransmitters. The imbalance of neurotransmitters can be corrected when the underlying cause[s] of the imbalance is properly diagnosed! What Makes Fibromyalgia Treatment With Us So Successful? The team at the Sponaugle Wellness Institute has successfully treated over 1,500 fibromyalgia patients, mostly females. Clinical research has proven that fibromyalgia patients suffer from undiagnosed medical disorders that cause an imbalance of neurotransmitters, the chemical messengers that increase or decrease the “electrical voltage” in our nerves. Diagnosing and “fixing” the underlying cause of fibromyalgia is obviously better fibromyalgia treatment than simply masking the symptoms of fibromyalgia with medications like Lyrica and Opana. These addicting medications simply “turn down” the excess “electrical voltage” caused by harmful toxicity issues. Big Pharma would have you believe their “symptom treatment’ is the solution, however, masking the symptoms with a medication that reduces electrical activity does nothing to correct underlying disorders that ultimately cause neurotoxicity and subsequently, damage to brain and body nerves. Our research has proven that the common denominator in chronic fatigue and fibromyalgia patients is neurotoxicity, the excessive accumulation of toxins in the brain and nervous system. To diagnose the underlying causes of fibromyalgia, we perform a comprehensive analysis of over 400 biochemicals, brain chemicals, hormones, biomarkers for infection, toxin biomarkers and nutritional markers. Ninety percent of the fibromyalgia patients treated at Sponaugle Wellness Institute suffer from gut toxicity which is often diagnosed by other wellness centers*. Diagnosing and treating gut toxicity is important, yet elementary, compared to the more sophisticated diagnosis and treatment of more lethal toxicity issues such as Mold Toxicity and Lyme Disease. Our research has proven that most fibromyalgia patients suffer from more serious levels of toxicity than that produced by intestinal dysbiosis and Candida overgrowth. Ninety percent of fibromyalgia patients suffer from undiagnosed Mold Toxicity, Lyme Disease and other blood pathogens like the Protomyxzoa Rheumatica parasite, Bartonella and Mycoplasma. 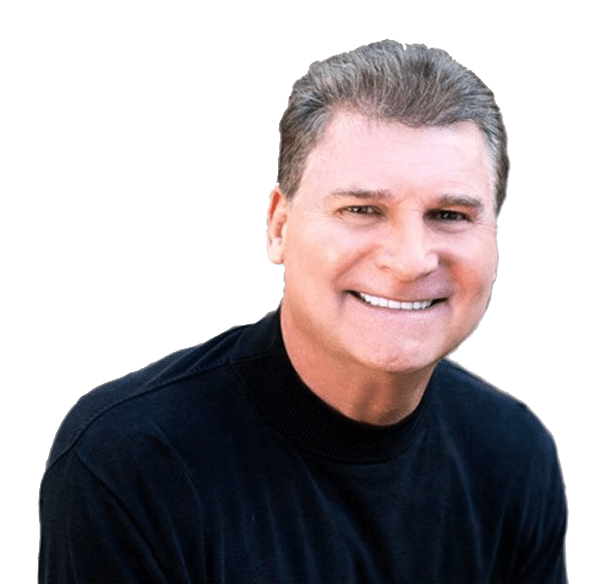 With an intravenous therapy Dr. Sponaugle developed to cure his wife and his daughter of the above toxicity issues and infections, he has successfully treated*. Fibromyalgia is derived from excessive electrical current running throughout the nerves in the body. Fibromyalgia patients suffer from “total body pain” because their nerves are over-electrified. This pain is from the excessive production of the electrifying neurotransmitters (brain chemicals) Glutamate and PEA. The blue coloration on the healthy brain demonstrates normal electrical activity. 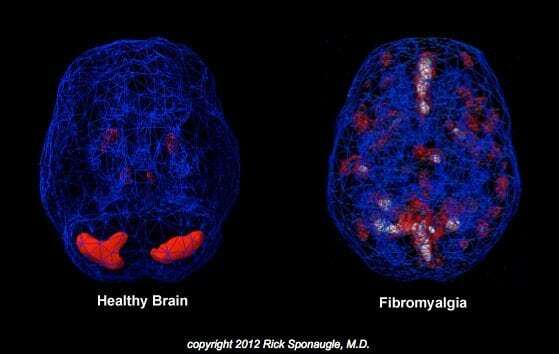 The additional red and white coloration on the brain scan of a fibromyalgia patient represents over-electrified brain regions. The brain is actually the “volt meter” that tells us how much pain we are experiencing, an over electrified brain will amplify incoming electrical pain signals from every nerve in the body. For this reason, fibromyalgia patients are much more sensitive to pain. Ill-knowledgeable physicians treat fibromyalgia with opiate pain medication; they remain unaware that fibromyalgia pain is ultimately worsened by opiate induced changes in brain chemistry. It is a known fact that American women suffer eight times more gut toxicity than men. They have more urinary tract infections because of a shorter urethra and they are over prescribed antibiotics for “chronic cystitis” which is actually not bacterial, but, yeast in etiology 90 percent of the time*. That’s why it is “chronic” cystitis, the gynecologist/family doctor is unknowingly treating a yeast infection with an anti-bacterial medication! The Sponaugle Wellness Institute team’s research comparing brain scans with extensive analysis of toxicity biomarkers has proven that Candida [Yeast] mycotoxins are not nearly as lethal to the brain and nervous system as are the toxic mold toxins produced by black mold, the Trichothecenes. However, like mold toxins, yeast toxins and bacterial toxins are fatty in molecular structure, they migrate from a toxic gut to the fattiest organ in the body, the brain which is 65 percent fat content. UCLA recently published a study proving that bacterial toxins and yeast toxins derived from a toxic gut can cause inflammation and destruction of the myelin sheath on brain nerves with resultant Multiple Sclerosis, they infiltrate and inflame the brain white matter, myelin, in a similar fashion as mold toxins, the toxic gases produced by molds in water damaged buildings. Women in America develop Multiple Sclerosis much more often than men because of their increased neurotoxin levels. During the initial years of undiagnosed neurotoxicty, most women notice a new onset of anxiety issues and fibromyalgia symptoms. With prolonged undiagnosed neurotoxicty issues, most women will develop Multiple Sclerosis, full blown destruction of the myelin sheath, the insulation on brain nerves. Using MRI of the Brain, we diagnose an average of two new female patients every month with Multiple Sclerosis. All suffer undiagnosed Mold Toxicity and Lyme Disease. Those women who suffer MS symptoms from severe Mold Toxicity often respond to Dr. Sponaugle’s Intravenous Mold Toxicity Treatment in one to two weeks*.